Scientists are studying hot flow anomalies, HFAs, and their effect on the planet Venus. Unlike Earth, Venus is without a magnetic field and although the effects of space weather are milder than that at Earth, they do occur much closer to the surface, which may be why these HFAs are putting on such an explosive show. In the grand scheme of the solar system, Venus and Earth are almost the same distance from the sun. Yet the planets differ dramatically: Venus is some 100 times hotter than Earth and its days more than 200 times longer. The atmosphere on Venus is so thick that the longest any spacecraft has survived on its surface before being crushed is a little over two hours. There’s another difference, too. Earth has a magnetic field and Venus does not – a crucial distinction when assessing the effects of the sun on each planet. As the solar wind rushes outward from the sun at nearly a million miles per hour, it is stopped about 44,000 miles away from Earth when it collides with the giant magnetic envelope that surrounds the planet called the magnetosphere. Most of the solar wind flows around the magnetosphere, but in certain circumstances it can enter the magnetosphere to create a variety of dynamic space weather effects on Earth. Venus has no such protective shield, but it is still an immovable rock surrounded by an atmosphere that disrupts and interacts with the solar wind, causing interesting space weather effects. A recent study, appearing online in the Journal of Geophysical Research on February 29, 2012, has found clear evidence on Venus for a type of space weather outburst quite common at Earth, called a hot flow anomaly. These anomalies, also known as HFAs, cause a temporary reversal of the solar wind that normally moves past a planet. An HFA surge causes the material to flood backward, says David Sibeck, a scientist at NASA’s Goddard Space Flight Center in Greenbelt, Md., who studies HFAs at Earth and is a co-author on the paper. Observing an HFA on Venus will help scientists tease out how space weather is similar and different at this planet so foreign to our own. With no magnetic field to interact with, space weather at Venus is milder than that at Earth, but occurs much closer to the surface. The search for this kind of space weather on Venus began in 2009 when NASA’s Messenger satellite, which is actually a mission to study Mercury, spotted what may well have been an HFA at Venus. But Messenger’s instruments could only measure a suggestive magnetic signature, not detect the temperature of the material inside, a necessary measurement to confirm the heat of a “hot” flow anomaly. For further evidence, Collinson turned to a European Space Agency spacecraft called Venus Express. Venus Express was not designed to study space weather phenomena per se, but it does have instruments that can detect magnetic fields and the charged particles, or plasma, that make up the solar wind. Collinson began to search for the telltale signatures of an HFA through a few days worth of data. Collinson looked for a pattern of magnetic change that would indicate the spacecraft traveled through one of these gigantic explosions. Envision what a bullet might experience if shot through a hot air balloon – a moment of heat in an otherwise fairly temperature-consistent journey. In this case, the heat comes with other characteristics as well: The boundaries show an abrupt change in the magnetic fields, and the inside is less dense than the outside. Given a set of instruments that were not specifically designed to find this signature, the search turned up quite a long list of potential, but not conclusive, events. But his work eventually paid off. A combination of magnetic and plasma data shows that a Venusian hot flow anomaly did indeed take place on March 22, 2008. By taking the Venus Express data and comparing it to the known physics at Earth, the scientists painted a possible picture of how an HFA forms at Venus. The moving solar wind with its attendant magnetic fields harbors discontinuities, areas where the magnetic fields change direction, sharply and abruptly. Sometimes these discontinuities align with the flow of the solar wind, so they remain in contact with what’s called the bow shock – the place where the supersonic solar wind slows down abruptly and diverts around the planet. If such a discontinuity travels slowly across the bow shock it allows time to trap particles, collecting pools of 10 million degree plasma that can expand to be as big as Earth. Those downstream disturbances are what make HFAs interesting. These eruptions create global disturbances far beyond the mere local disruption of a hot plasma explosion. These eruptions of solar material can compress the entire magnetosphere around Earth for minutes at a time, shaking the particles along magnetic lines and causing them to fall into Earth’s atmosphere near the magnetic poles to create dayside aurora. The bow shock on Venus serves as the boundary between the incoming solar wind, and the planet’s own ionosphere – a layer of atmosphere filled with charged particles. This boundary changes in height easily in response to the environment, and so the scientists believe it would also respond strongly in the presence of an HFA. Since the HFA causes material to flow sunward, away from the planet, it may operate almost like a vacuum cleaner, pulling that bow shock further away from Venus. The size of the ionosphere would swell in concert. That HFAs can occur on a planet without a magnetic field suggests that they may well happen on planets throughout the solar system, and indeed in other solar systems as well. 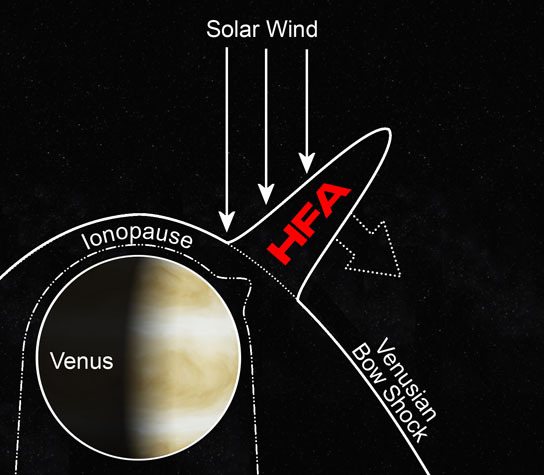 Be the first to comment on "HFAs and Their Effect on Venus"